February 27, 2015 February 28, 2015 ~ Trevis Dampier Sr.
“Trev, Is this similar to Chinese food or Japanese?” says the unknowing curious readers mind. I would say Thai food sits in its own realm but if there was a food that was similar then I would have to say Indian food. If you have never tried Indian food or Thai food then today’s blog post is going to be an adventurous read for you as I am going to open the doors to a new world to you; a world of dazzling colors, rich flavors, and hypnotizing aromas that will leave you begging for more. It’s Friday! Man it has been a long week. Don’t you hate those. Anyways, I’m glad it is Friday and I finished all my meetings at work and time for me to meet up with my sweetheart for lunch. She was going back and forth in her mind on what to eat via text message but in my mind I was already back stroking in a river of coconut milk. As I backstroked down the white serengeti river, I can see chickens and catfish swimming next to me with herbs and mushroom hats on and then……. Anxiously typing,”Thai food! 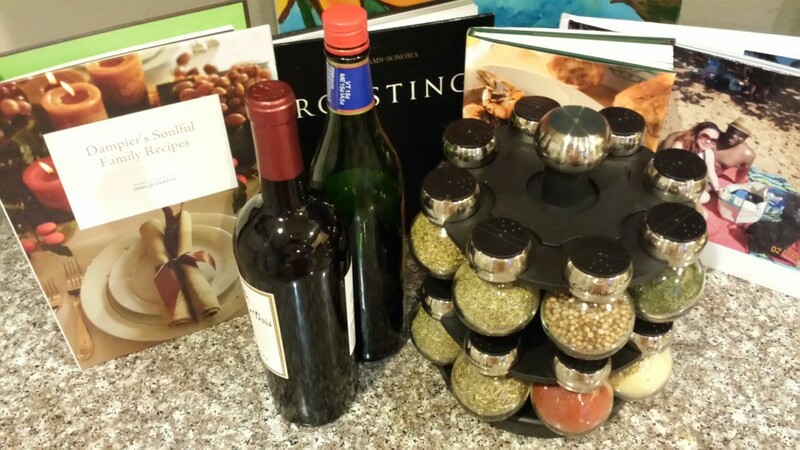 Let’s do Thai!” I exclaim. She agrees, and we are on our journey to a place of fascination, a place of warmth, a place of satisfaction. Yes! Thai food here we come! I’m pumped! Today our expedition brought us to one of my favorite places in the Bay Area called Pad Thai! They have a great tasting soup and their fried catfish is out of this world! If you try what I ate today then I promise you that you won’t be upset. As a matter of fact, most Thai places have the same types of food so if you look for the same items on the menu that I mentioned in this blog post then you should be very grateful and adding Thai food in your monthly diet. 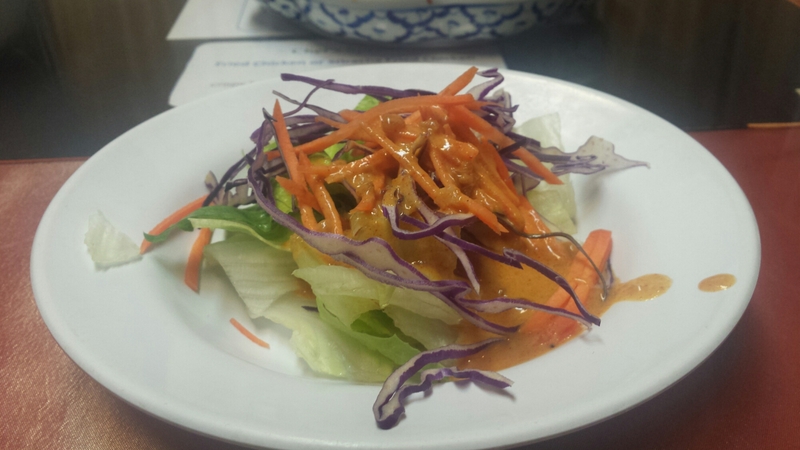 Upon ordering your food, every Thai place that I have been to gives you a appetizer salad with peanut sauce that they bring out before your order. You will see Peanut Sauce a lot on the menu so be aware if you are allergic. The peanut sauce with the shredded carrots, lettuce, and shredded cabbage really gets you ready for the upcoming festivities with a small punch of sweet and tangy. Now it’s time for some live action eating! One thing I would first like to mention is that, Thai restaurants make the best soups! The soup you see in the picture is called a Tom Kha soup; which is a spicy and sour soup in coconut milk, mushrooms, galangal, lemon grass and a touch of lime juice. I chose chicken with it but you have the choice to add tofu, seafood or prawns to it as well. No worries, they always ask if you want your food mild, medium or spicy and just tell them you want it mild. 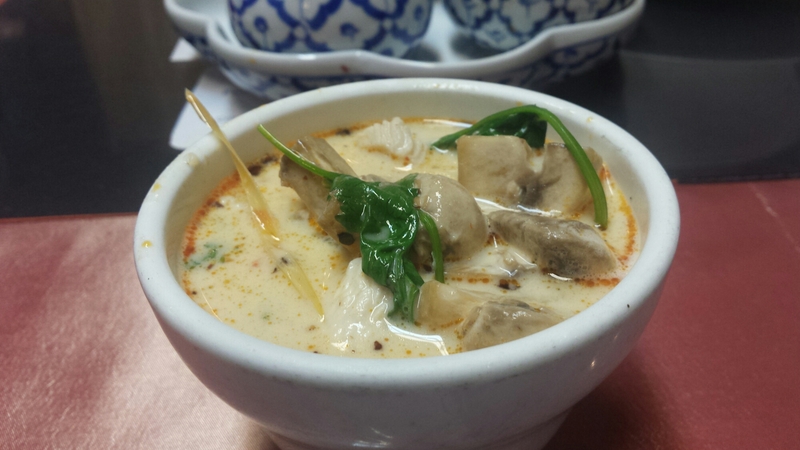 The Tom Kha soup is incredible! The mushrooms are plump and delicate in texture, the chicken is thin and succulent as well and the coconut milk is flavored so that when you place the spoon in your mouth it is hard for you to remove the spoon because you never want that experience to stop. Then after all your moans and groans(sounding like an Rated R movie) while sucking down that soup they bring out the catfish with your choice of brown or white rice. I always choose brown rice to make sure you get your fiber dose while engaging in these delectable treats but the choice is up to you. When they place the fish on your table you can envision the flavors you are about to experience just by looking at. I can see sweet, I can see tangy, I can see citrus. I take the fork and my first bite consists of a bit of red and green bell pepper and one slice of catfish. Instant explosion in my mouth! The first firecracker goes off and the next one and the next! The catfish has a slight crunch, it is tender and soft in the middle with a sweet, tangy spice to it surrounded by a layer of flavor. There is a burst of citrus that comes from the vibrant colors of the bell peppers and with the rice combined it gives it a subtle drop in spicy temperature so you can keep the fireworks going until the last bite. This is utter fulfillment; a meal where you leave feeling filled in the belly but also in contentment as well that you made the right choice, you unlocked the Matrix, you achieved greatness today! That’s live action eating folks! See you next time on my next adventure. It was great spending time with you again. Make sure you follow my page! 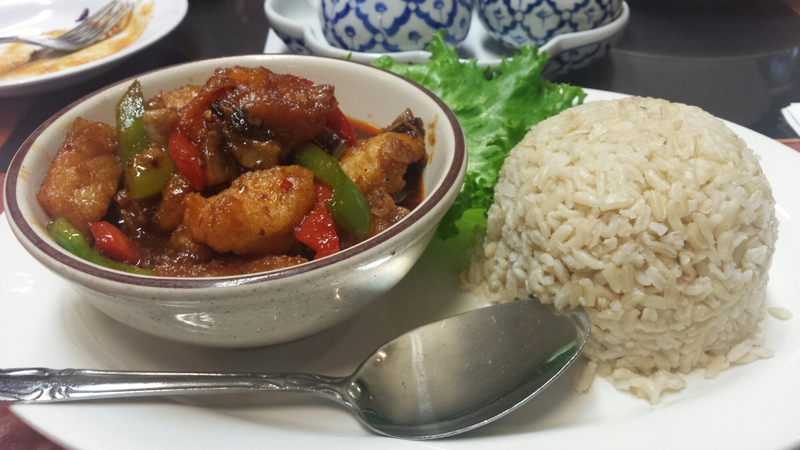 and please comment on Thai food adventures you have had or feedback on this.